ÈTar spot is a common, visually distinctive and fungal leaf spot disease. Tar spot can affect many species of maple including big leaf, mountain, red, Rocky mountain, sugar, and sycamore maple. 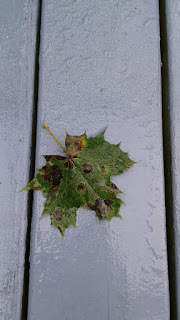 If a maple tree develops a relatively small yellow spot or spots on the leaves, then it is most likely that tree has tar spot. The spots can remain small or they can get bigger as the season progresses. Worse, they can spread across the entire surface of the leaves. As this fungus matures, the centre of the infected area will become raised and turn black. Find out more in my upcoming ebook: From My Garden. From My Garden is based upon the weekly articles I have been writing for the Campbellton tribune.